Welcome to the sposorship page of the website. Specialists in Clinical Negligence and Personal Injury law. Installers of PVCu Windows, Doors, Conservatories, Porches, PVCu Products. Address: Hendderwen, Gilfachwen Road, Llandysul. SA44 4HU. 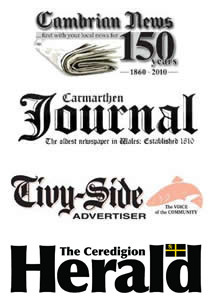 Address: Aberythan, Pentrellwyn, Llandysul, Ceredigion. SA44 4LH Hot Dumplings Chinese and Thai Takeaway. For the very best in Chinese and Thai cuisine. Address: 12, Northgate Street, Aberystwyth, Ceredigion, SY23 2JS. A small family-run funeral director service at the heart of Aberaeron providing emotional support, expert and practical advice. Wide choice of real ales, Big Screen TV, Sky and BT Sports and a beer garden. Address: Fronhaul, Ciliau Aeron. SA48 8DL Sponsor Required.